I’ve been playing MUD1 solidly since my last post, and I think I’m finally getting to the point where I’ve explored most of the game. There are still a load of things I haven’t discovered a purpose for, and a few areas I can’t get to, but I’m pretty sure I’ve experienced the bulk of the game. I have some time off work coming up, so I reckon that I’ll be able to wrap this game up with one more post. Because MUD1 is so large, and I’ve accomplished a lot in the last week or so, I’ll break up what I’ve done into smaller categories. The answer to the north tomb’s riddle was indeed ‘one’: if you begin with one rat, of course you will only have one at the end. This was the first puzzle I (okay, Brian) solved, but I did have a fair bit of parser trouble while figuring it out. I tried all sort of variations of SAY “ONE”, or just “ONE” in quote marks, but the correct method was just to type ONE with no other command or punctuation. This opened the tomb, and inside I found a sceptre and a gold filling. The south tomb’s riddle was a cryptogram, which Voltgloss helpfully decoded for me: “A monument has a relief painting with three shepherds pointing at a tomb. Beneath it are eight letters. What are they?” A spot of Googling revealed that this was a reference to the Shugborough Inscription, a mysterious sequence of letters carved into an 18th century monument. Nobody is sure what the letters mean, but they read OUOSVAVV. Sure enough, typing that in opened the tomb. I didn’t find anything inside though, which was a genuine disappointment. I don’t think it matters really, but more on that below. The southwest tomb’s riddle is very clever, and again it was Voltgloss who alerted me to the answer being searchable via Google: the numbers refer to the birth dates of John Wayne (the Duke), Queen Latifah, and Elvis Presley (the King). The answer then is Prince’s birth date, which is June 7th 1958 (or 6758). Based on this riddle, it seems as though the riddles are updated periodically, because I very much doubt that Queen Latifah was relevant when MUD1 was first created. Even Prince might have been a stretch. Finally, the southeast tomb was the only one that I figured out myself. I didn’t actually solve the puzzle, I just reasoned that if I kept typing out locations in the wilderness I’d hit on the answer eventually. It took a while, but the answer was RUIN. You can see how many points any treasure is worth with the VALUE command. Normally I’d be annoyed by the nature of these puzzles: two of them require a decent amount of research, and knowledge that exists outside of the game world. This is the sort of thing that breaks the verisimilitude of a game, but it works better for me here than it would in a lot of other games. Maybe it’s just that they’re not critical puzzles; you don’t have to do them, they’re just there as obstacles hiding some treasures. 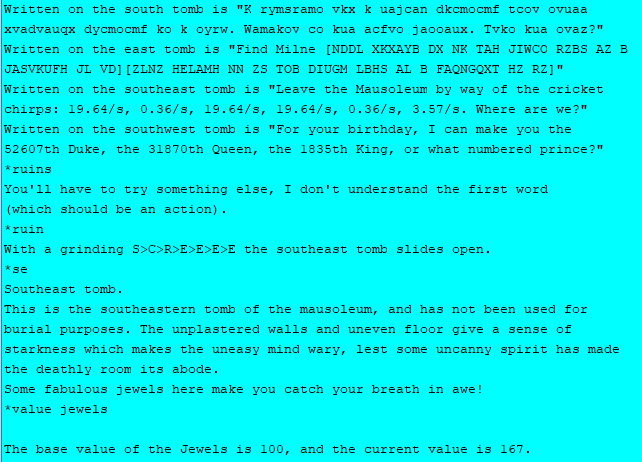 There are still two tomb riddles I couldn’t solve, but I’m not fussed about it. 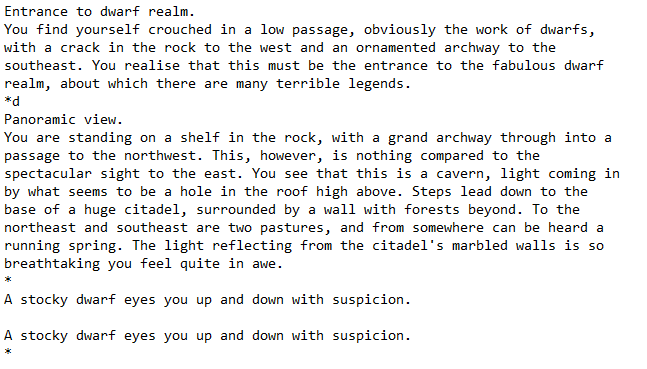 Every time I’ve been back the contents of the tombs have been different, so I figure that it’s randomised, and I’ve probably seen whatever’s in them. Inside the Badger’s Sett: I had previously found a badger’s lair in the forest, but when I tried to enter the badger stopped me by trying to claw my face off. I finally went back, and I was able to get in. I’m not sure what made the difference, but maybe it was that I was higher level than the last time I tried. Inside I found a chamber with a magnifying glass and a belt buckle, both worth points when dropped in the swamp. The lens had a message that I’m pretty sure commemorates a former player who passed away in 2015. The room description mentions that treasure can be stored safely in the sett, and that the badger will guard it. Maybe that’s why I couldn’t get in before? Perhaps the badger only allows the first person inside to enter, or the first person to store some treasure there? The Graveyard: I did some poking around on Richard Bartle’s MUD1 site, and found a map of the graveyard. Following it led me to another tomb, and a silver cross that I was able to swamp for some points. 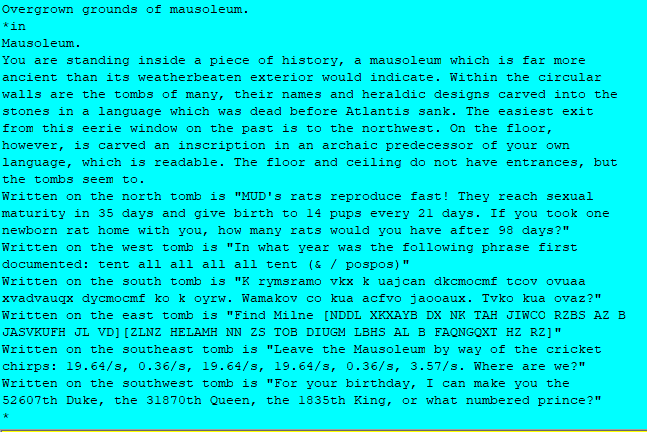 I wasn’t able to open the tomb, but I was given this clue “A prise will open the tomb”. I can’t think of any items I’ve found that would suffice. The Mine: Looking over my notes, I saw that there was a shed in the mine that I hadn’t unlocked and investigated. Inside I found a pickaxe (good for mining tin ore from certain mine areas) and a safety lamp. The lamp is a handy item: it replaces the flaming brand, which has a tendency to explode in certain areas (most notable the swamp). Unlike the brand, it has a time limit, as once the wick is burnt out it can no longer be used. I haven’t found a way to replace the wick, if it’s even possible. Also in the mine are some narrow cracks that can only be explored if you’re not carrying anything. This includes light sources, so these tunnels have to be navigated in the dark. 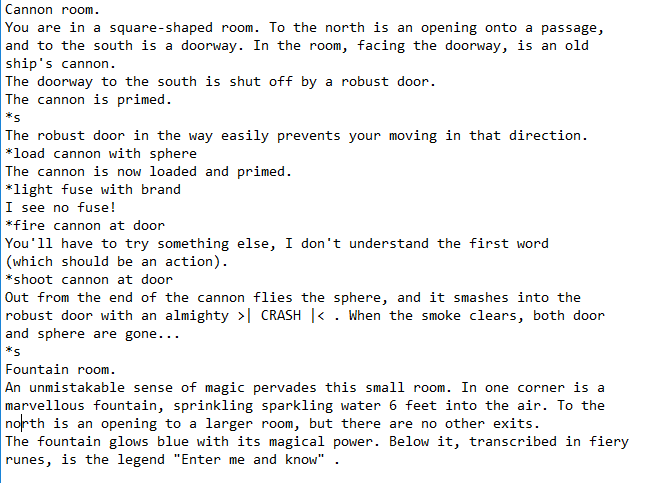 I went in, carefully mapping the various exits and rooms, hoping I’d eventually get to a lit area. I never did, and I’m pretty sure I explored every possibility. Obviously I’ve missed something here. The Dwarf Realm: Quite a while ago I’d made it through the mine and into the dwarf realm, only to be immediately killed by a dwarf (what else?). This time I was armed with an axe and some extra levels, which meant that I could kill those dwarves with impunity. There were about half a dozen roaming around, as well as a golden eagle that very nearly did me in. About to murder some dwarves. Wizterm, the program that I use to access MUD1, logs every single game you play as a text file, so I grabbed some images from there because I’m terrible at remembering to get screenshots. The realm itself was little more than a large cavern with some forested areas and a fortress. At the top of the fortress there was a gate that I was unable to open. A clue read “Drop the key on me and I shall open”. I had the key with me, but no amount of dropping could get the gate to open. I wonder maybe if I had to drop it on or give it to a dwarf, or maybe the eagle? It’s something else for me to try. The Cellar: Previously I’ve mentioned that the cellar under the house is crawling with nasty rats. After gaining a few levels and arming myself with the axe I was able to head down there and clear the place out – I swear there were over a dozen, and you can only fight them one at a time. There are two exits from the cellar. One leads into a coal bunker, which will explode if you go in with a brand. The bunker is filled with more rats, and a piece of anthracite which can be swamped for points. South from the cellar is a tunnel with soft, earthy walls. You have to be careful navigating this tunnel, because the walls will collapse with one wrong move. You also can’t turn around to go backwards once you’re inside, as the tunnel is too narrow. It leads to a chamber that’s underneath the woodsman’s hut, containing a moose head and a marble pillar. The pillar is valuable, but it’s also too large to get back through the tunnel. I remembered that there was a space for a moose head in the hut though, so I went back there and hung the head on the wall, which opened a trapdoor in the floor. I was then able to get the pillar out and swamp it for more points. The Attic: Also in the house is a cupboard with a stepladder inside that seemingly led nowhere. The ladder was too heavy to move, so I figured that there must be a way up from the cupboard, but every time I tried to climb it I was asphyxiated due to its cramped confines. Eventually I figured out that this was due to the flaming brand, as I was able to climb the ladder safely once I had the lamp. It still didn’t lead anywhere, until I climbed it with the cupboard door closed. This opened a secret door, and I was able to get into the attic. The attic is a treasure trove. 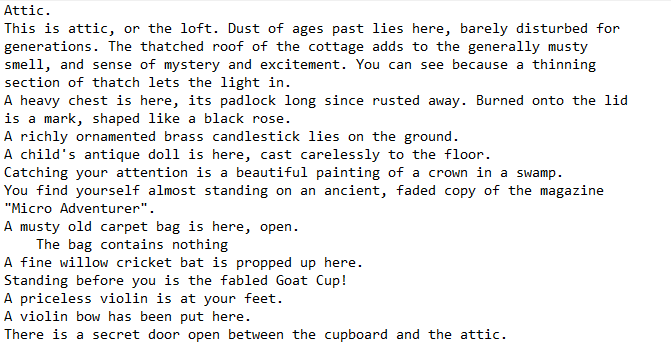 Inside I found all sorts of stuff: a candlestick, a doll, a painting, an issue of “Micro Adventurer”, a cricket bat, the fabled “Goat Cup” (whatever that is), and a violin. All of these are worth points. There’s also a trapped chest that kills you if you open it, but that can be swamped as well if you just take the chest without looking inside. Alongside all of this is a canvas bag, which greatly increases your carrying capacity. Getting into the attic was definitely worth it, but the problem was getting out. You can’t get in without closing the cupboard door, but you also can’t open the cupboard from the inside. The game flat out tells you that the only way out is to wait for another player to open it. In 2019 this is a much less viable option that it originally would have been. Instead I dropped all of my stuff, quit the game, restarted, and went back to the cupboard. I was then able to open it and claim everything, which probably would have been harder back in the day when the game would have been full of other players scrambling for treasure. The Attic. It’s a lot to take in all at once. The Wrecked Ship: In my last post I mentioned that I had found a boat, and using it I was able to head out into the ocean to the wrecked ship. The ocean is somewhat dangerous: a shark that’s difficult to kill is swimming about, and if the weather gets rough you’re likely to get killed. There are a few useful items to be found on the ship: some earrings in the crow’s nest, some silk and a raft in the hold, as well as some gunpowder and a fuse. There’s a wafer that can be eaten to restore some health. The captain’s logbook has some cryptic clues that seem to involve a wizard. From the crow’s nest I was able to see two islands, one to the south and another to the northwest. A chart in the captain’s cabin has incomplete directions for getting to the northwest island, so I gather that one will harder to reach. I’ll try to explore them before my next post. The Goblin Lairs: With a weapon, a key and some levels I was finally able to wipe out all of the goblin lairs and raid their treasure chamber, where I found a gold plate, a flute and a bracelet. Past the goblin lair I found an area with two rooms and some sliding panels. One of the panels I couldn’t move, and another caused a force field to appear and block me in. I have no idea what to do here. Not far from the goblin lairs I had previously found a cannon, and now I had some gunpowder and a fuse. Together with a platinum sphere that I used as a cannonball, I was able to use the cannon to blow apart an especially sturdy door. Behind the door was a magical fountain, which gave me loads of points when I jumped in. The water turned yellow, and I was tempted to take another dip, but caution held me back. Blasting my way into the Fountain Room. Following another tunnel out of the goblin lairs led back around to the gate near the idol. I wasn’t able to open it from this side either, but at least I knew where it led now. In this area I found a brass ring, but due to a mysterious force I wasn’t able to lift it. Also nearby was a guardroom, wherein I found another axe, a die, and a carpet. The die increased in value depending on the number that came up when you rolled it, but constant rolling is a risk because a 1 will kill you. The carpet is magical, and when you unroll and ride it, it transports you to the temple under the yew tree. Under the Yew Tree: With the lamp I was finally able to fully explore beneath the yew tree. As I probably mentioned before, there’s a tree you can chop down with the axe, opening up some tunnels below. I’d been there before, exploring some temple chambers, but there was one tunnel that I hadn’t been able to get past with the flaming brand due to some very dry and flammable roots. Cue the lamp, and a new area to explore. This tunnel lead to a large chamber, with three branches. The southern branch led to a room with a barrel full of reddish liquid, and another room with muddy walls. I wasn’t able to figure out what to do here, although emptying the barrel did give me a description of the water running away and soaking into the walls, so I gather that has something to do with it. The west branch leads to a steaming pool, with a pendant on the far side. Crossing the pool is deadly, but it can be frozen with an icicle that can be found not far from the temple. The pendant, of course, can be swamped for points. The east branch is the most interesting, and potentially the most deadly. The first room has a vicious wolf, which might have killed me had I not remembered the wolfsbane in the garden (which you might recall drained my score quite significantly when I tried to smoke it). After a quick trip I returned and fed the wolfsbane to the wolf, which killed it. The rooms beyond were all scorched with fire, and I started to suspect a dragon might be present. Instead, they ended at a fiery pit, that served seemingly no purpose. As I’ve discovered, there’s very little in this game that’s just for show, so I figure there’s something to do here that I haven’t figured out. Killing the wolf. That number in square brackets lets you know when your score has been increased. So that’s my progress for the last week-and-a-bit, which feels pretty significant now that I’ve typed it all out. The ultimate goal of the game is to become a Wizard, but with a requirement of over 100,000 points I’ll probably skip it. I’m currently an Enchanter, with a score of around 7,000. I’d probably be able to reach the Wizard level with some perseverance; instant deaths don’t wipe your character, and most of the battles aren’t a problem for me anymore. Other players are the only real danger left. Even so, if I do try to go for Wizard it’s going to be on my own time. The blog must progress. That’s a decent amount to go on, and I’m thinking now that this game might have more left to offer than I had thought. Regardless, my next post will be my last for MUD1. It’s time to wrap up the next few games, and get out of 1978. PREVIOUS POST Previous post: Let’s Play Amberstar (Amiga, English – Blind), Part 63: Rematch With the Waterdemon!